UNICEF supported 12 day training course for probation and child rights promotion officers in the NorthEast province concluded Friday with the presentation of certificates to the participants at an event held at the Provincial Guest House, Uppuveli, a suburb in Trincomalee town. The training course is a part of a two year-project on "Strengthening the capacity of the Department of Probation and Child Care", UNICEF said in a press release Friday evening. Mr. V.P.Balasingham, Provincial Secretary for Ministry of Rehabilitation, Reconstruction, Social Welfare and Women Affairs, Mrs. N.R. Ranjini, Director of Probation and Child Care Services, and Ms. Gabriela Elroy, Head of Office, UNICEF Trincomalee presented certificates to the participants of the training course, sources said. 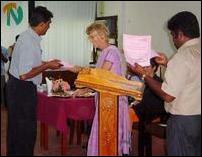 UNICEF Trincomalee zone head, Ms Gabriela Elroy hands over certificate to a Probration and Child Care officer. Mrs. Anne Grigg, of Voluntary Services Overseas, working in the Department of Probation and Child Care in Trincomalee conducted the training. "UNICEF is delighted with the efforts of the probation officers and child rights promotion officers. We congratulate the Department of Probation and Child Care staff for carrying out awareness programmes at the village level on the importance of family, and how important it is for children to be at home with their parents," Ms. Elroy said. "We look forward to a long collaboration with the Department of Probation and Child Care, and in supporting the ongoing efforts of probation and child rights promotion officers to raise awareness of childrenís needs," she added. The aim of the project is to increase the ability of Department staff to carry out child protection initiatives in local communities, specifically focusing on their work with childrenís homes, said the UNICEF in its press release. During the training, managers of 150 childrenís homes throughout the NorthEast attended workshops on properly managing and supervising childrenís homes. The project is focusing on encouraging proper monitoring of childrenís homes, the development of care plans, and promoting all childrenís homes to be registered, the press release further said. Ms Anne Grigg hands over certificate to a participant. Ms N.R.Ranjani hands over certicate to a participant. Throughout the project probation and child rights promotion officers are working at the local level with Divisional Secretariat staff. Furthermore, the training supports the work of probation and child rights promotion officers in encouraging the importance of family, and promoting wherever possible children to live at home with their parents. Unfortunately, many children currently in childrenís home have at least one parent at home, but are sent to childrenís homes instead of growing up in their communities, UNICEF press release said. UNICEF is pleased to announce that this week also saw the beginning of another round of training for Provincial staff on child rights. The first three days of this nine-day programme were completed Friday. 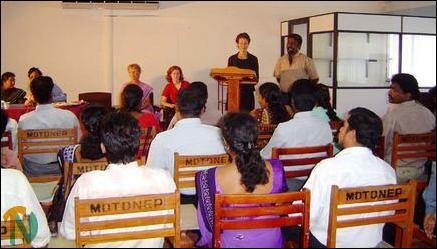 The other training components will be held in September and November 2004, UNICEF said in its press release. Ms Gabriela Elroy speaking at the function. 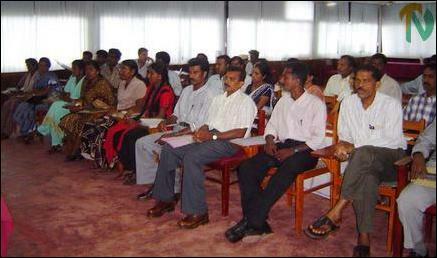 A section of the participants in the training programme on Child Rights Promotion.